Listen to our podcast “Raising Children with Autism,” by clicking here. To download this podcast from iTunes, click here. 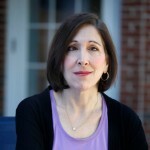 Our guest blogger this week is Liane Kupferberg Carter. Recently I spent an entire day in an exhibitor’s booth at Mt. Sinai Medical Center in New York. It was their annual Advances in Autism Conference, and I was there to autograph copies of my new book, a memoir about raising my autistic son. All day, a steady stream of parents stopped by my book display. They confided their parenting heartache. 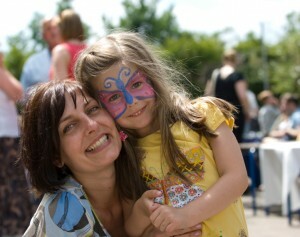 They celebrated their children’s hard-won successes. Most of all, they needed me to listen. It was painful and cathartic, and I was glad to do it. But I was startled at how many of them had autistic children in their 30s, 40s and beyond. Why were they still attending autism conferences? I wondered. Was there anything left to learn? There is always something to be gleaned, of course. A nugget of new information. A promising new treatment. Mostly, though, I believe their presence at the conference was a testament to the persistence of hope. Because I still feel it too. I hold the same hopes for my autistic son Mickey as I do for my typical son Jon. The same ones any parent has: to have loving friends, good health, work that is meaningful to them, and to live the most satisfying, independent lives they can. I’ve been lucky. I have ease and comfort in my life. A strong marriage, a pretty home in a safe neighborhood, loving friends and family. My disabled child has grown into a happy, affectionate, empathetic young man with a great sense of humor. Still, my husband Marc and I inhabit a peculiar no man’s land. Our children are grown, but we are not empty nesters. Because Mickey has epilepsy, we can never leave him home alone. If we want to go out, it still entails hiring a sitter… even though our “baby” is 23. All our rites of passage – Mickey’s and ours as his parents – have looked a little different than typical ones. When most children turn 18, they are free to make their own legal and medical decisions; before Mickey’s 18th birthday, we had to petition the court to become his legal guardians. It was unique and humbling. We had to prove we’d been good enough parents, so that they’d allow us to continue in that role. And while other parents shepherded their kids to visit colleges, we toured government-funded day habilitation programs. I expected to find other young adults there. Instead, I was shocked to see people in their 50s, 60s, even 70s. That’s when it finally hit me: when they call it ‘adult services,’ they aren’t just talking about young adults. People think of autism as a childhood disability, but it isn’t. It’s lifelong. Mickey will be an adult for far longer than he was a child. As a special needs mom, I’ve had to learn to pace my anxiety and my fears. Fear of life-threatening seizures. Fear he will die young, which would be unbearable for us. Fear that we will die too soon, which would be unbearable for him. And the ultimate dread: who will love him when we are gone? The most loving thing we can do is to prepare him to leave home. But statistically speaking, he is likely to live with us a very long time. According to Autism Speaks, approximately 80 percent of adults with autism up to 30 years old are still living at home. We’ve placed Mickey’s name on our state’s housing list for disabled adults. Currently the wait is 10 years. Unlike typical 20-something year olds, Mickey shows little interest yet in moving out. I’m not ready yet to push him out of the nest either. But I’d be lying if I didn’t admit that after nearly 30 years of parenting, part of me longs for a little more freedom. Being cheerful was her choice. Day by day, year by year, it’s one I’m making too. 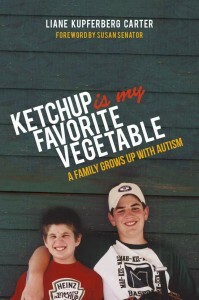 Liane Kupferberg Carter is the author of the new memoir Ketchup is My Favorite Vegetable: A Family Grows Up with Autism (Jessica Kingsley Publishers.) Her articles and essays have appeared in many publications, including the New York Times, the Chicago Tribune, Parents Magazine, Grown and Flown, Better After 50, and the HuffingtonPost.